Artist’s illustration of 2014 UZ224, informally known as DeeDee. The ALMA radio telescope array was able to observe the faint millimeter-wavelength "glow" emitted by DeeDee, confirming the object is roughly 395 miles (635 kilometers across). At this size, DeeDee should have enough mass to be spherical, the criteria necessary for astronomers to consider it a dwarf planet, though it has yet to receive that official designation. The solar system's dwarf-planet population is about to increase by one. 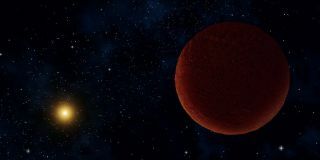 The far-flung object 2014 UZ224 — informally known as DeeDee, for "Distant Dwarf" — is about 395 miles wide (635 kilometers), new observations reveal. That means the frigid object probably harbors enough mass to be shaped into a sphere by its own gravity, entitling it to "dwarf planet" status, researchers said. DeeDee is therefore the second most distant "trans-Neptunian object" with a confirmed orbit at the moment, researchers said. The dwarf planet Eris is more far-flung, though that's not always the case; Eris is currently about 96.5 AU from the sun, but it never gets more than 98 AU from Earth's star. For perspective, Pluto orbits the sun at an average distance of 40 AU, with a maximum orbital distance of 49 AU. But the Blanco data did not allow the discovery team — which was led by David Gerdes, an astronomer at the University of Michigan — to pinpoint DeeDee's size. While the researchers suspected that the object is a dwarf planet, they couldn't definitively determine from the optical observations whether DeeDee is relatively small and bright, or big and dark. So Gerdes and his colleagues studied DeeDee with the Atacama Large Millimeter/submillimeter Array (ALMA), a system of powerful radio telescopes in Chile. ALMA picked up the faraway object's heat signature, which is directly proportional to its size. "We calculated that this object would be incredibly cold, only about 30 degrees Kelvin, just a little above absolute zero," Gerdes said in a statement. ALMA image of the faint millimeter-wavelength "glow" from the planetary body 2014 UZ224, informally known as DeeDee. At three times the distance of Pluto from the sun, DeeDee is the second-most distant known trans-Neptunian object with a confirmed orbit in our solar system. ALMA also measured DeeDee's brightness in millimeter-wavelength light, finding that the object reflects just 13 percent of the sunlight that hits it. That means DeeDee is about as dark as the dirt on a baseball infield, astronomers said. The discovery and study of DeeDee (which has not yet officially been anointed a dwarf planet) shows that astronomers can probe the deep outer solar system and that similar techniques could potentially spot Planet Nine, the big world hypothesized to lurk out there undetected, researchers said. "There are still new worlds to discover in our own cosmic backyard," Gerdes said. "The solar system is a rich and complicated place."